Call our office at 479-273-3486. Please have your credit card ready. Print the pledge form and fill it in. Please check to see if your company has a matching gift program. These programs allow you to allocate your company's charitable dollars to the cause nearest and dearest to your heart, greatly increasing your donation's value to LCBC. How would you like to help LCBC help people learn to read and their families simply by shopping or searching the Internet? Simply by using the links below for the goods and services you normally use, you can support LCBC. It’s that easy. And there are no additional costs for you. Shop with your favorite merchants and LCBC will receive a donation with no extra cost to you. LCBC has joined the Slickdeals Gives Back program to bring you the best deals and coupons from thousands of online retailers. And the best part? While you save money, you'll be raising money for Literacy Council of Benton County at the same time! Simply go to Slickdeals Gives Back to register for free, select Literacy Council of Benton County as your designated non-profit and start shopping. All your shopping activity earns us points, and you’ll earn double points when you shop at our three bonus stores - Amazon, Walmart, and Newegg. Add Slickdeals to your smartphone to check for deals on the go! Help LCBC by simply searching the Internet! Use www.goodsearch.com (powered by Yahoo!) as your search engine and LCBC will receive a share of the revenue generated by site advertisers. Simply enter “Literacy Council of Benton County” as the organization you want to support and start searching. Help LCBC by simply shopping on the Internet! Use http://www.goodsearch.com/goodshop.aspx (powered by Yahoo!) as your shopping site and LCBC will receive a share of the revenue generated by your purchases from participating businesses. 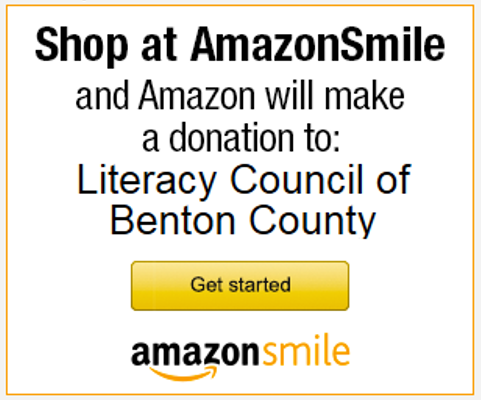 Simply enter “Literacy Council of Benton County” as the organization you want to support and start shopping. When shopping on eBay, use eBay giving works and favorite us as your charity. As a buyer, you can donate directly to LCBC when purchasing an item. As a direct seller, you can select a percentage of sales to be donated to LCBC.